A widespread affection for the butterflies was evident. Collaborations with Luther College and Central College and high schools in Marshalltown and Grundy Center have established demonstration plots on those campuses. Even a Boy Scout troop in Story City contacted Hellmich and is growing three milkweed species in the town’s prairie plot. 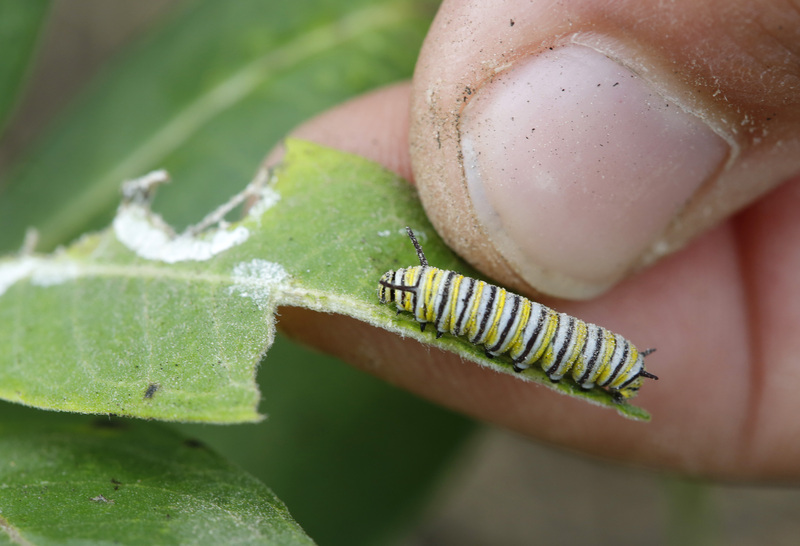 The Iowa State University Research and Demonstration Farms established plots of milkweed from seedlings to determine the best growing conditions and to acquaint producers and the public with the many different kinds. One lesson learned was that the seedlings planted in isolation within demonstration plots had to be protected from deer and rabbits. Growing the “weeds” may seem counter to farmers and gardeners usual practices, but the plant is essential to monarch reproduction because the butterflies lay eggs only on that plant, which the larvae then feed on. Hellmich and Steve Bradbury, a professor in the natural resource ecology and management department, have been working with the consortium, researching ways to increase the plants. There are nine kinds of milkweed being studied to find the best ways to plant and cultivate them, and which are most attractive to monarchs. Students surveyed milkweeds to see which have the most eggs and feeding larvae. Bradbury said milkweed gets a lot of the attention, although there is a range of plants needed for the monarchs. The consortium’s web site (http://monarch.ent.iastate.edu) has several resources to help establish monarch habitat including research publications and news about its activities. It offers firsthand accounts of researchers and links to more information, such as a site to report monarch sightings as they migrate. Iowa State recently received a USDA Natural Resources Conservation Service grant “to develop and accelerate the adoption of innovative approaches to monarch butterfly conservation” in agriculturally intensive corn and soybean production areas. “We want growers and others to consider where they can establish milkweed sites: maybe little odd shaped areas where they can’t farm, maybe some riparian buffer areas or even along fence rows,” Hellmich said, adding that dozens of locations have been identified on the university’s research farms. Bradbury said butterfly habitat might fit in with some of the nutrient reduction strategies, such as bioreactors or saturated buffer zones, which usually are planted in brome grass. Grants awarded by Iowa Soybean Association and the Iowa-USDA Natural Resources Conservation Service are supporting studies on introducing milkweed and nectar plants to link increased habitat and nutrient reduction in a single conservation practice. The Iowa Pork Producers Association also is funding research into establishing monarch habitat around swine production facilities. 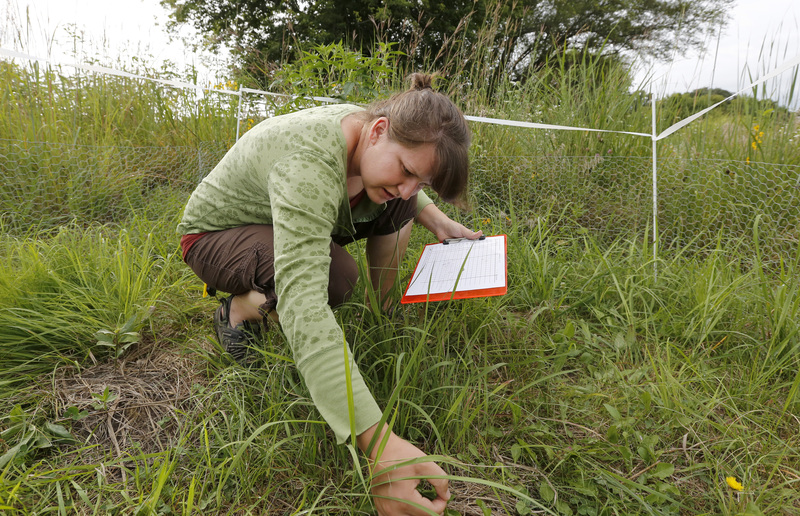 Graduate student Teresa Blader surveys milkweed plants for monarch eggs and larvae. Monarch larva feeds on milkweed.